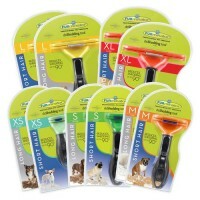 FURminator makes sure your dog or cat is perfectly groomed! 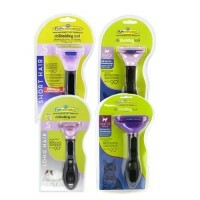 FURminator supports proactive dog and cat owners to make their pet's health and well-being a top priority. 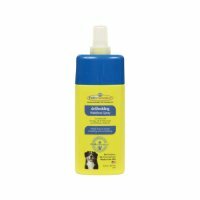 Proper grooming is an essential aspect of the dog and cat care regime as it helps pet owners to quickly identify and treat issues like skin problems associated with the presence of ticks, fleas and dry patches. The same is true for other common and bothersome health issues like infection or inflammation of the nails, teeth, ears, and eyes. Trustworthy brands like Furminator help pet owners discover a range of high-quality pet grooming tools and products for protecting the health of their entire household, pets and people. 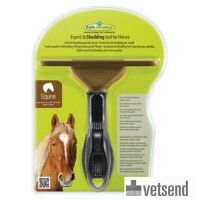 Grooming is more than just about giving your furry friends a bath and brushing their coats every now and then. Informed pet owners know that the process begins with identifying the most trustworthy brands from which to buy their pet grooming supplies. Furminator offers a range of products that addresses and helps pet owners pay attention to all aspects of the grooming routine: Brush, deShed, Bathe and Discard. Shedding season can be a most frustrating time for pet owners. They offer solutions for the dog, cat, carpet and couch. The UK brand offers a range of dog grooming products that allows pet owners to achieve professional pet grooming in the comfort of their own home. Dog brush choices range from the dual grooming brush to slicker brushes of varying sizes and bristle hardness and softness. 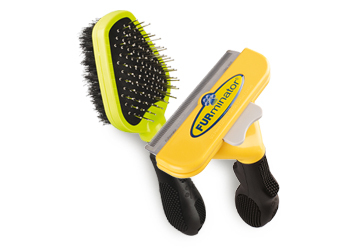 A popular deshedding tool for dogs is FURminator for Dogs. 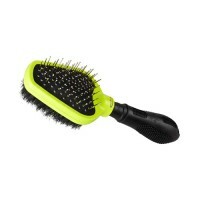 Dog owners can order the brush that best suits their pet's coat - fine/short hair or medium/long hair. The ergonomic design of each dog brush reduces pressure on the animal's skin during the grooming process by helping groomers to detangle and smooth it's fur without pulling. Fur balls is an unpleasant experience for both cat owners and their pets. A cat's tongue is like a built-in health care provider. Licking its fur is a means for your furry friend to not just clean itself, but to also distress and regulate its body temperature. Proper grooming by pet owners makes for a healthier, happier animal. 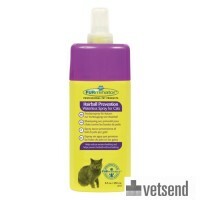 Regular brushing with FURminator for Cats helps to cut down on shedding and therefore the amount of hair your loyal feline companion is likely to ingest during self grooming. 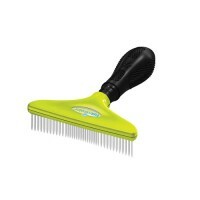 Furminator's range of Undercoat deShedding Tool are designed for cats of varying sizes, small, medium or large with short or long hair. Pet owners can shop with confidence according to the needs of their feline friend. Grooming creates and deepens the bond between the pet and its owner. It's no secret that cat's can be particularly moody about being handled. Grooming helps to sensitise them so they become less agitated when touched. Brushing plays a vital role in maintaining the health of the skin and coat of your furry animal friends as it aids in the even distribution of the natural oil they produce. Frequent brushing also ensures the pet's fur stays mat free, and allows pet owners to discover and treat hidden wounds or developing skin conditions. A huge bonus is less animal fur on your furniture, on the carpet, clothes and around the home.